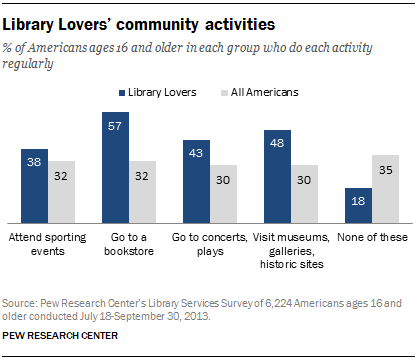 We recently released our latest report, a typology of public library engagement in America. 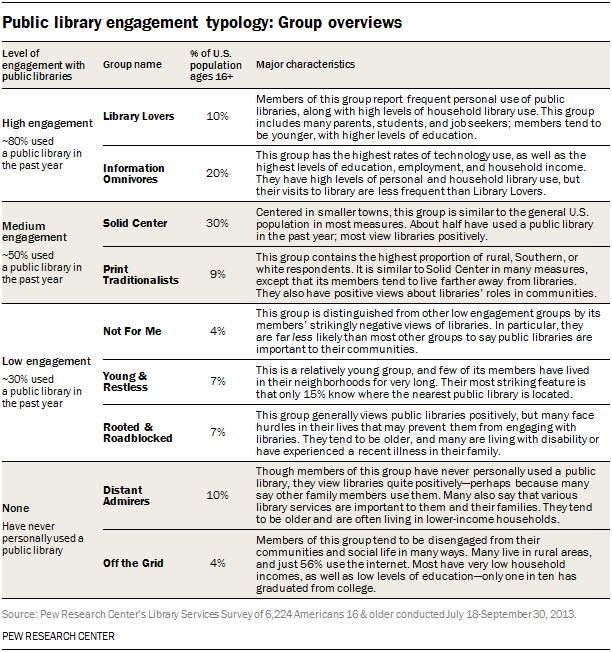 Using the data behind our previous report on how people value libraries in their communities, this typology divides Americans into nine groups that reflect different patterns of public library engagement along a general spectrum of high, medium, low, and non-engagement. This approach is a little new for us. Our previous reports have explored topics such as what people do at libraries and library websites or how Americans value individual library services based on traditional factors such as gender, race/ethnicity, age, and household income, but this typology moves beyond basic demographic descriptions. Instead, we used statistical analysis to cluster individuals into groups based on their usage of, views toward, and access to libraries, in order to discover larger insights about how libraries fit into American culture. The following table provides an overview of the typology groups. Life stage and special circumstances are linked to increased library use and higher engagement with information: Deeper connections with public libraries are often associated with key life moments such as having a child, seeking a job, being a student, and going through a situation in which research and data can help inform a decision. Technology users are generally library users: A common narrative is that Americans are turning away from libraries because of newer technology, but the data shows that most highly-engaged library users are also big technology users. In fact, members of the high engagement groups are more likely to use the internet than lower engagement groups. The most intense library users are also the most likely to be frequent bookstore visitors: “Library Lovers” represent the most highly engaged group in the typology. They are also big readers: Most of them read books daily, and they read an average of 27 books in the past year. And despite their higher levels of library use and the fact that most prefer to borrow books rather than purchasing them, 57% say they visit bookstores regularly (a higher proportion than any other group).